What makes Hershey so sweet? From the Hershey’s Kisses streetlamps and life-size candy bars to family fun and indulgent experiences for grownups, it&apos;s hard not to smile while you&apos;re in Hershey The Sweetest Place On Earth®. Let&apos;s take a look at why Hershey is so sweet! 1. See Hershey’s Kisses Streetlamps: You know you’ve arrived in Hershey when you see the signature Hershey’s Kisses streetlamps. More than 107 lamps line Chocolate Avenue and appear around Hershey, alternating between wrapped and unwrapped chocolates. When was the last time a street lamp made your mouth water? 2. Meet Life-Size Candy Bars: There’s no sweeter costumed character to meet than one of Hershey’s life-size candy bars. If you bump into one of our sweet friends, they are always eager to pose for a picture and give big hugs. Hershey’s Characters often hang out near the Hershey Triple TowerSM and the Carrousel, so keep your eyes open for them around Hersheypark®. It’s not uncommon to see them at Hershey’s Chocolate World for special events or welcoming guests at one of The Official Resorts of Hersheypark®. 3. Go Behind-the-Scenes of a Hershey’s Chocolate Factory: In Hershey The Sweetest Place On Earth® you’re invited to unwrap the sweet secrets of candy-making. It’s free to take the Chocolate Tour at Hershey’ Chocolate World where you’ll follow the chocolate process from roasted cocoa beans to each glossy candy wrapper. And there’s always a delicious complimentary sample waiting for you at the end of the ride. 4. Be Wrapped in Chocolate: The Spa At The Hotel Hershey® is your relaxation destination, and they use Hershey&apos;s chocolate and cocoa-infused treatments to create the ultimate decadent experience. From a Chocolate Fondue Wrap to a rejuvenating cocoa facial, you deserve a little "me-time" to get your glow back. 5. Taste a Signature Chocolate Martini: Only in Hershey can you sip the sweet serenity of a Hershey’s® Kisses™ Signature Chocolate Martini. It&apos;s one of those drinks that goes down a little too easy. Indulge with a mix of salty and sweet as well when you try the Reese&apos;s® Peanut Butter Cup Martini, a blend of peanut butter rum, chocolate vodka, and chocolat liqueur. Say cheers with one of these chocolate concoctions at a bar inside The Hotel Hershey and Hershey Lodge, or at Devon Seafood + Steak and Houlihan&apos;s on Chocolate Avenue. Since you last visited the town, a new, revitalized downtown shopping and eating district has emerged under the Hershey’s Kisses streetlamps. The new Hershey Towne Square along Chocolate Avenue is a destination within a destination with restaurants, boutique shops, and a brewery. In the summertime, the tables and umbrellas will come out to provide some of Hershey’s best outdoor dining. 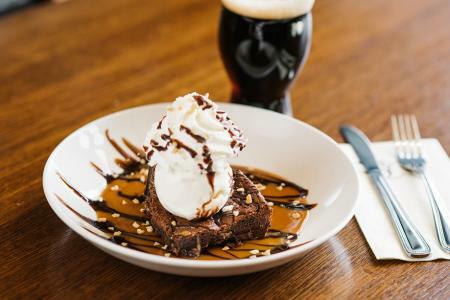 Iron Hill Brewery is a casual yet upscale restaurant with deliciously prepared and plated scratch-made food and 20 years of brewing experience yielding refreshing and creative beers for every palate. Best of all, Hershey Towne Square is in the middle of an already bustling area that’s safe, clean, and walkable. If you usually zoom into Hershey for the coasters, take a detour to explore downtown Hershey. Fenicci&apos;s of Hershey is an Italian restaurant that&apos;s steeped in Hershey history. From their homemade sauces and famous Upside-Down Pizza to their family-friendly, group dining atmosphere, Fenicci&apos;s is a tradition for locals and visitors alike. Combine puzzles and pilsners at Escape Room Hershey and Hershey Biergarten, where your group can successfully unlock the secrets of an escape room (or not. It&apos;s okay. ), then celebrate with shareable bites and a brew or two from Hershey&apos;s largest craft beer selection. If you can score a downtown Hershey hotel, you&apos;ll find an ample selection of things to see and do right outside your door. 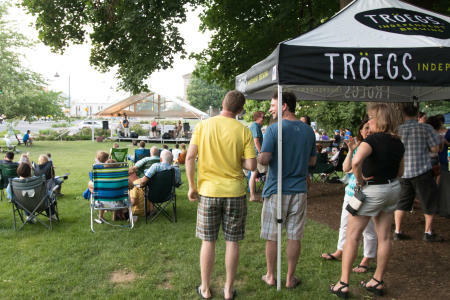 You might even stumble upon a block party like one of Downtown Hershey&apos;s Life on Chocolate Events that include pop-up markets, concerts, kids activities, and chocolate-themed celebrations. It&apos;s a way for visitors and locals to come together to enjoy all that Hershey has to offer. 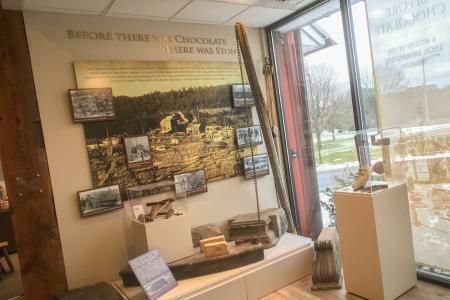 Hershey chose to build his factory in this region of Pennsylvania because it was near his birthplace and near dairy farms to ensure a steady supply of milk. 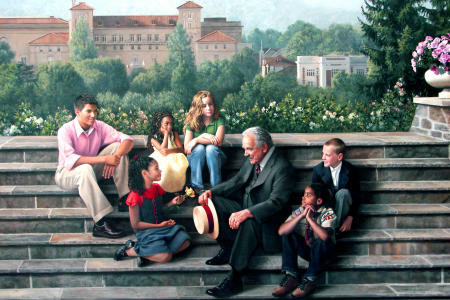 In addition to the chocolate factory, Hershey invested in buildings all over the town including The Hotel HersheySM, Hershey Theatre, Hersheypark® Stadium, and his legacy, the Milton Hershey School. The Circular® restaurant has its signature rotund shape because Milton Hershey didn’t want any guests to dine in a corner. In 1912, Hershey and his wife reserved a first-class stateroom on the Titanic, but they fatefully changed their plans at the last minute! A copy of his deposit check is on display at the museum. Milton Hershey wanted a nice garden of roses for his wife Catherine. 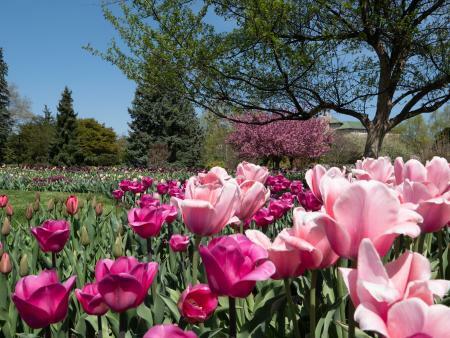 The Hershey Gardens have blossomed into 23-acres of botanical beauty. Before there was chocolate, there was stone! This region, particularly the neighboring town of Hummelstown, thrived on quarrying brownstone, a special kind of sandstone with a chocolate-brown color. Stone from this area was shipped all over the country, most notably as building blocks for Brownstone row homes in the Manhattan borough of New York City. The region was settled by Europeans of Scotch and Irish descent who formed a number of small towns and villages. After Milton Hershey opened his chocolate factory in 1903, these neighborhoods became incorporated into the larger town of Hershey over the next few decades. To date, the Hershey Bears have brought 11 Calder Cup championships home to Hershey. Fans can check out the Hershey-Derry Historical Society & History Museum’s to explore the largest public collection of Bears history or dine on the ice at The Bears DenSM, styled to resemble a hockey arena. Sports Shorts: Did You Know...? Hershey Bears used to be the Hershey B’ars. Their logo was a bear, so it was an easy switch after the league noted that the name was a bit too commercial. Wilt Chamberlain played his famous 100-point game in Hersheypark® Arena. Legendary golfer Ben Hogan was the pro at Hershey Country Club in 1941. In 1953 he participated in a Hershey golf clinic, an event held in honor of President Dwight D. Eisenhower’s 63rd birthday. Hersheypark: A full day of coasters means you’ll need to eat lunch and dinner, and a few snacks, ice cream, and chocolate, of course! Save some sweet cash at Hersheypark by taking advantage of their dining and drink programs. You can drink and eat all day for one low price! Some of the best amusement park souvenirs are the post-ride photos! Whether you look excited or scared, a Ride Photo Pass gets you unlimited digital downloads of your ride photos and discounts on photo purchases like keychains and prints. 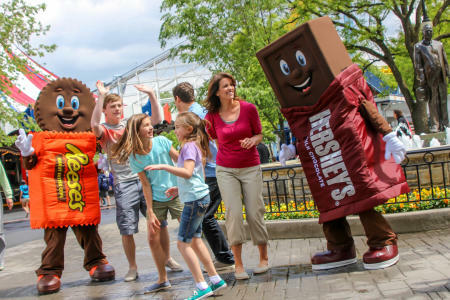 Check out the Insider Tips for Sweet Trips blog including the best times to visit to avoid the crowds and which Hershey hotels have the best Hersheypark perks. Hershey Gardens & The Hershey Story, Museum on Chocolate Avenue: Both of these attractions pay tribute to the life of Milton Hershey, and you can experience both with a Gardens-Museum Combo Pass! Hershey’s Chocolate World: There’s a lot to see and do at Hershey’s Chocolate World! If you can swing it, visit on a weekday when it’s less crowded. You’ll get to savor your experiences even more, and maybe take the free Chocolate Tour more than once! You can save money on all their chocolate-inspired activities like Create Your Own Candy Bar and 4D Chocolate Mystery Show with ticket bundles! Chocolate Town U.S.A.SM has so much to see and do!